Long time ago, in the ancient ages, Dal Riata was terrorised by a terrible and fierce creature. It was none other than Cerberus (Greek mythology - Three-headed dog) the mighty three headed lion. It caused enormous destruction of our land and took lives of many, until a few powerful wardens decided to rise and end it's reign of terror by killing the creature once and for all. However, Cerberus proved to be much too powerful than they had expected. The wardens tried their best but couldnt kill it. They managed to wound it to near-death, at the cost of their own lives.The heavily wounded Cerberus, couldnt fight anymore and do anything. So it went on to hide somewhere hidden to everyone else. Its been slowly healing itself all these decades, watching everything thats been going on in Dal Riata with its keen eyes, getting ready to strike again. Now, a dark cloud hovers over our land, as that day has finally come when Cerberus rises from its rest and spread its wrath over Dal riata once again. Its up to our heroes now to fight this fierce creature and bring peace again, just like the wardens did once. Watch out heroes, this is going to be one tough fight. The three heads on the monster resemble fire, poison and wind giving it very high resistance against fire, poison and magiic damage. After 50% of its hp is down, it starts casting 'Rise from the Ashes' every 10 minutes, summoning three fierce hounds that help their king in its destruction. Roar of the Winds: Gives out a giant terrorizing roar, striking fear into it's enemies, causing an enormous reduction in Attack and attack speed for 20 seconds. Poison blow: strikes the player having aggro dealing upto 4k poison damage. Demon Sight: The extra eyes on this creature allows it to see into the near future and protect itself from coming attacks for 10 seconds. Im not really creative on the specifics of the drops part, but in my imagination, it drops rings and charms and helms. A good enemy would be Goblins in a new cave area. Goblins are always great in other fantasy games and also in books. They usually belong in caves and so there should be a new cave zone dedicated to them. 20% Druid: Healing Staff. Gives skill Natures Healer. Upgradable. If traded, skill points stay on it. Book of rebirth does not work on it unless you are the person that put the skill points on it. Max heals 10,000 hp. 20 magic damage. Attack Speed 3000. Proc skill is Corrupted Healing. It has a 20% chance. Damages the target by 20 poison damage per tick. Lasts for 5 minutes. +1000 focus. Requires Level 195. 10% Rouge Offhand: The Slayer's Slayer. 500 poison damage. Adds skill: The Resistance. gives you or targeted player 500 vitality for 2 minutes and 1000 armor for 90 seconds. 10% Ranger Bow: The Piericer. Attack speed is 2000. does 200 piercing damage. Gives Skill "Advanced Archery". The skill does 50 damage per tick for 5 minutes. Non-upgradable. Proc skill is Several Shooting. It shoots 30 arrows at the same time. 10% proc chance. 10% Ranger Quiver: The Ultimate Quiver. 600 piercing damage. Adds skill: Hyperactive. More advanced version of Rapid Fire. Non upgradable. Increases attack speed of you or a targeted character by 90%. Proc skill is 50%. Shatters the targets armor by 20% for 1 shot. Infinite Arrows. 10% Warrior sword: The Sword of The God of Warriors. 550 slashing damage. 2284 attack speed. Skill: The Master Of Armor. (boosts everyone in you groups armor by 5000) Non upgradable. Proc Skill: The slasher: does up to 5000 damage. Also shatters armor. 5% chance. 10% Warrior shield: The Tankers Shield: 2000 Fire resistance. 2000 ice resistance. 2000 magic resistance. 2000 chaos resistance. 5000 armor. Gives 1000 strength. 20% Concentration (Mage and Druid) Starts at "Recovers 80 Energy per tick for 30 seconds" Each skill point adds +20 Energy per tick and +10 seconds. 20% Survivor (All Classes) Start at "When you are at your last 20% you transfer 10% of the targets hp you you." Each upgrade adds 5% of the hp transferred. Max hp transferred is 80%. When upgraded to 80%, upgrading only adds "Steals 5% of speed". Upgrades 2% speed every upgrade. Only works on players and 4*s and below. Every 50 armor on the target reduces 5% of health transferred. 20% Deep Cut (Warrior) Similar to rupture. Requires a axe, sword, or dagger. Everything else the same as rupture. 20% Dagger Throw (Rouge) Throws a dagger 5 times. Damage is Weapon Damage + Offhand Damage + Total multiplied by 3. Adds 3% damage every upgrade. 20% Arrow Piercer (Ranger) Multiplies damage by 2x. Each upgrade adds 5% more damage. Last edited by Jasonlinblue on Fri Jan 02, 2015 2:45 am, edited 1 time in total. They've been hidden in the graves of underwater Norse-Sunken ships, far off the coast of Lirs Reach! Taking years to mature and adapt skills, they've come ashore to Lirs and under command of the All-Mother Serpent Aristh! The All-Mother Serpent Aristh has been around before the Norse, but when they came with ships, some of them she slew and made them perfect nests for her eggs! They all drop rings / braces / and ancient Norse relics from the deep sea! The All-Mother is a random level boss always 6* with multiple streaks of Norse stained gold through her scales / she is a Deep Purple Color and has a Goldish/Yellow Underbellie! She does CHAOS, POISON, and SLASHING DMG. She drops a rare All-Mother mount, rare rings and braces from beyond Norse times! Since we talk about this holiday season here is my quick creation. Plush animals, and toy soldiers. The toy tree's can have some cristmas decoration on them. These are no ordinary toys, they have been brought alive with Yulefathers wrong formula and have escaped. These toys although small, have aggressive behavior and people should be warned for their deadly hugs. Their objective is to steal gifts and breed more evil toys. These vicious toys drop different types of candy and presents that can either be used and eaten. Or they can be brought to Yulefathers helpers for gifts and traded for yulefathers enchanted weapons and shields. Once the toys have collected enough presents they start to create a giant toy. I am a man of many talents, however, one of which is not drawing. I may have steady hands but I am lost when I am left to just a piece of paper, a pencil and my imagination. All rights and copyrights associated with the image listed, belong to the respective owner. The description however is my own work and is in no way associated with the rights of the image. Farvugar is the *** son of the Horned Celtic deity God Cernunnos - The Lord of wildlife and animals. After being born into the world he was instantly outcasted, with no knowledge of his father, and his family murdered from a Bushfire, he was alone. Farvugar had to fend for himself, adapting to his surrounding. He was born into the world inheriting animalistic features, most notably his deer like head and thick long hair all over his back and legs. However he also had acquired human characteristics, the physiology and anatomy of a human body (excluding his head). Unlike other beasts, Farvugar is small in stature and has no chance in battle unless, they were on his terms. Being outcasted gave Farvugar a lot of time to adapt to his surroundings, this exclusion encouraged him to make alliances with the most terrible of Celtic Demons, Crom Cruach. The alliance with Crom Cruach was Farvugar's way of rebelling against the society that had outcasted him, and this alliance allowed him to study the anatomy and battle techniques of his enemies with the endless amount of resources Crom Cruach made accessible to him. The malicious intent Farvugar has for his studies, has proven worth to Crom Cruach. This granted Farvugar his opportunity, his opportunity to take revenge onto those who casted him out of the social cliques. Farvugar has been a nomad all his life. He could never really settle in one place for too long, either because the locals would turn up with pitchforks at his door screaming "monster" and "half-breed" as well as other purgatories. So he got used to the life of adapting, settling down quickly and moving on. By being a nomad, it means this boss, Farvugar is never found quite in the same spot, he has a random spawn between three places. Each of these places have their own negative debuff (or aurora effect - one could say), these debuffs are immune to Farvugar, as they are of his creation. Background- Farvugar, in contact with Crom Cruach organised to take highshore village captive. They managed to smuggle powerful Ents (Villanous Trees - As seen in the Otherworld) to siege the small village while Farvugar terrifies residing heroes and challenges fearsome foes. Intention: Farvugar seeks to find information on Farcrag castle. He seeks to find weaknesses in the castle guard, and eventually infiltrate the castle with the aid of Crom Cruach to take down the almighty Lord Maclir. Quest Story: Hero, thank goodness we found you! Farvugar has returned with a vengeance, he has struck the soul of Lirs Reach, Highshore village and is seeking answers! You must, with the aid of your allies thwart his plans to infiltrate Farcrag Castle! Highshore Village Atmospheric Debuff: Farvugar has managed to elementally modify Crom Cruach's Ents. He managed to imbued the power of poision into their roots, and the trees are taking in the oxygen of Highshore village and turning it into posion. Luckily, Farvugar only managed to modify FOUR trees (each tree is guarded by adds - like their own mini boss, but a lot less health - lots of resistance) these trees are found just outside the boundaries of Highshore village, highly guarded. This Debuff, is a DoT and does 800 (debateable) damage per tick. The Four Tree's: because of the amount of energy, and continued strain on the trees from omitting the Poison into the air, they cannot attack foes. The trees only defence, are their guards, these guards have large amounts of health and attack! Negating the Debuff: The are two ways to negate this debuff. One of which is to kill the trees, every time one tree dies the debuff is weakened making it less damage per tick. The second; A crafty Apothecary in farcrag castle, has crafted up a tonic - however he isn't willing to give up his ingredients for free, there is a price for the ingredient list (you buy the ingredient list, and then you have to craft your potion from finding ingredients that are rare to come buy and some common - this will expand economy). Farvugar's Skills: because he is a naturalist, he does come equipped with a cloak of thorns, and a huge resistance against magic, and ice - however his weakness is fire (as his family died from a large bush fire). He has a skill, where he casts *Poison Bomb* which if debuff is active, gives a 50% boost to debuff. Or if not active makes a 30 second DoT on players in close proximity. *Call of the Wilds* is a skill that brings in all adds nearby to heal him. *Natures Sympathy* is casted when he is at 25% health left, this casts practically an energy shield around him. When Farvugar reaches 1% health, he lets off a smoke bomb and disappears with all his adds back to Crom Cruach, however in the quick haste he leaves his loot bag behind to the brave heroes that had slain him. Farvugar's Weapon: Farvugar carries around something of his own invention, which is an atlatl - this allows him to shoot miniature arrows at his foes. In close range he comes equipped with two poison daggers. Background- Farvugar has successfully sneaked into Farcrag castle, by posing as a beggar wrapped in cloth, he has killed the main entrance guards and opened to doors to assemble his allies. Intention: Farvugar is seeking to end his pain and suffering where it all began, here in Farcrag castle lies Lord Maclir, and his death will see Farvugar's personal vendetta succeeded. Quest Story: Hero, thank goodness we found you! Farvugar has returned, right here in Farcrag Castle! We are not safe, no one is safe you must rally your friends and take him down! The life of lord Maclir lies in your hands, and I'm sure he would reward you handsomely if you could just go to his aid. Farcrag Castle Atmospheric Debuff: Farvugar while posing as a helpless beggar, managed to plant smoking contraptions all over the castle. These contraptions blind all heroes decreasing their defence, and their attack. Negating the Debuff: There are no known ways of negating this debuff, however it is rumoured that if you wield a torch in your offhand that it helps you see things a lot clearer, granting you more attack and defense. First line of defence: Farvugar has brought with him a breaching party of Barbarians. He has been in contact with the north coasts off of Lirs Reach. There are 12 adds in this encounter, each barbarian is a heavy hitter - well trained in the art of combat, they have high slash, crush and, piercing resistance, however not used to the magical world of Lirs Reach they have weakness to all things elemental. *Croms Life Drain* Crom Cruach recently imbued Farvugar with the skill of life drain. Background- Miners at the Fingal cave encampment have accidentally stumbled across one of Farvugar's hiding caverns. The place has been trapped and rigged, so that only the strongest will survive to battle Farvugar. Intention: The accidental discovery of one of Farvugar's secret caverns, have put his plans at risk! He must stay and defend his cavern, so his intel on Crom Cruach and his malicious intentions don't get put in the wrong hands. Quest Story: Hero, thank goodness we found you! Miners have managed to uncover one of secret caverns. Fortunately he is still inside, however he has the place rigged with traps! We need you and your allies to go in there and flush him out, so we can keep fingals cave safe. Fingals Cave Encampment Atmospheric Debuff: The cavern is covered in lavish green crawlers and vines, these vines omit a sweet sent that makes the heroes that enter feel tired - resulting in a debuff to defence, and also ensnares all that enter (bolas effect) and to add to that Poison leaks from the vines of the plants creating a DoT effect. Negating the Debuff: There is a tonic that, ingredients can only be found in the cavern. * Some spawn locations for Farvugar, may be in an illogical space, and some encounters may seem a tad over the top (or lack - I do apologise, I am tired) but I think they are all quite achieve able with the right strategy and players. Taranis smashed his tankard against the wall in frustration. Splinters of wood and twisted metal peppered his nearest sycophants, who cringed and cowered before the thunder god’s wrath. “YOU INCOMPETENT FOOLS!” the god bellowed. It had been nigh a fortnight since he sent his minions out to wreak havoc and ensure that the world was encased in a neverending winter. So far, he thought, all they have done is fall before the heroes of Lir’s Reach. How dare these mortal upstarts interfere with the plans of GODS! As if in counterpoint to his thoughts, the great door of his throne room blew open, smashing against the walls with a crash to rival even the thunder god’s fury. A fist of jagged ice and snow could be seen beneath the portal, before finally crumbling on the entryway. Blasts of icy wind tore through the room, cutting through exposed skin and leaving feathery wisps of frost on the glass settings. The Boggan priests nearest the doors collided against their compatriots, clawed feet scrabbling for purchase. In the middle they stopped, heads bobbing left and right. They were unsure of which was more terrible to life and limb, their master’s fury, or the power behind those doors. “Neverending winter, you say? Heh!” a voice cackled. “WHAT DO YOU WANT, OLD HAG?” Taranis said as he settled into his throne. In the mountains, a wolf howled. The Cailleach Bheara is described as a one-eyed hag with bad teeth. She rides a frostwolf into battle, and has 2 black ravens perched on her shoulder. She carries a hammer made of human bones. She is the Hag of Winter, and is said to have created the wolves, the deer, and the mountains and hills, the latter by smashing her hammer against the ground. She awakes at the start of Samhain, and rules over the land until just before Beltane, when she turns into stone. She decides not to sleep this season and forms an alliance of convenience with Taranis to keep the world under a cover of ice. 1. Howl of Winter – Lower DEF rating; Slow attack speed; Area of effect – Cone. Digdi’s wolf lets out a piercing howl, chilling her enemies, and making it harder for them to evade her physical attacks and skills. 2. Conspiracy of Ravens – Multiple instances of piercing damage; AOE – radial. Digdi’s ravens call to their kind to converge and swoop down on her enemies. 3. Earthsplitter – AOE – Linear, crushing damage. Digdi smashes the ground in front of her, causing it to erupt in waves traveling in a line. 4. Ice Spike – Single Target. Digdi raises her hammer, calling forth the power of the water buried in the ground, to rise up as an Ice Spike, impaling her enemies. 5. Freeze – just freeze. Lol. Last edited by Keemosabi on Wed Jan 07, 2015 11:39 pm, edited 1 time in total. 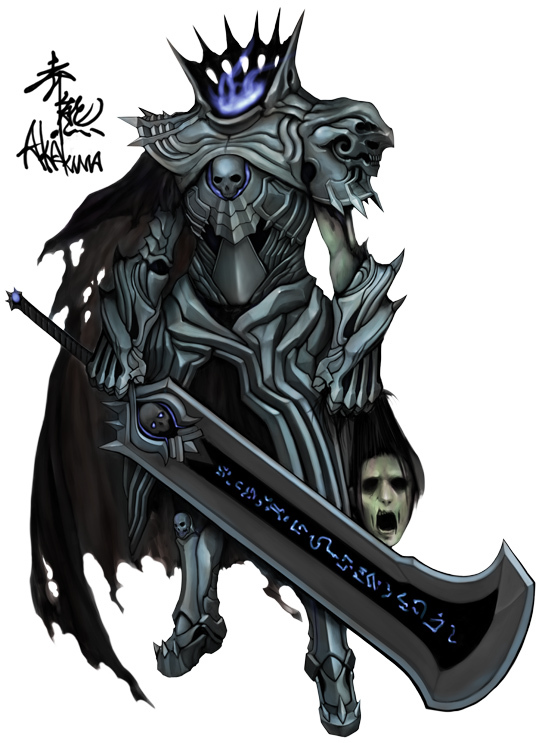 Lord of the Dead: The main skills that would make him a hard boss would be... Raise Dead: raises 3 of his skeletal warriors to aid him. Soul Punch: deals little damage in a large radius.